So, just to clarify... you are allowing an untrained, unlicensed, uninsured gal to put liquid adhesive on your eyes. Not sure what to say about that. Oh wait, yes I am. Let me start by saying that I get it! You are getting an incredible deal! Eyelash extensions can range in price from $100 to $250 for the initial application. That is a lot of money. With this basement tech, its a screamer at only $45 and you get another $5 off if you refer your friends. 40 bucks. Right! And as it should be. Your DIY trained lash technician saved tons of money by cutting around all of the red tape; no license, no training, no rent, no insurance, no taxes... it would save me tons of money too! But its risky for many reasons. First, let's consider the lack of training. 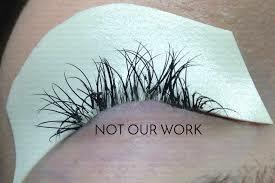 Eyelash Certification Courses usually cost about $2000 and there is a reason. Skilled professionals train licensed technicians to use medical grade adhesives to glue individual lashes, one by one, onto your lashes. It is a delicate, very intricate technique, and in untrained hands, it is very dangerous. 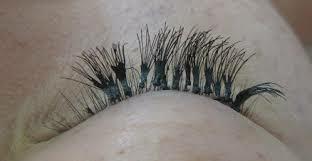 On the lighter side, you may just lose your eyelashes, which should grow back. No worries! However, on the heavy, getting that glue in someone's eye can cause burning, severe irritation and if bad enough, blindness. Proper training is necessary because in the event that something goes wrong, the technician will know what to do to save your eyes and your lashes. Hopefully this will never happen, but let's pretend you end up with glue in your eye and you are severely injured. Straight to the hospital you go. Who is going to pay that bill? Your good-deal-slinging basement tech? Highly unlikely. Licensed technicians carry insurance or are insured by the salon or spa they work for just in case something like this happens. Having good insurance is one reason that a licensed technician, salon or spa has to charge more for services. Oh but don't worry! You will have someone to sue if you get hurt... Grandma. That's right. You'll probably be going after her home-owner's policy. That should be fun. (Sorry Grandma!) But I'm guessing that because you knew you were getting them done in an unlicensed arena, you'll be paying that bill yourself. And just for kicks, take a look at the photos of the eyelash extensions below. These are great examples of extended lashes done by untrained lash technicians. They are fabulous, aren't they? Can you imagine letting these babies grow out? Actually, that would be a good day considering the modest (cough-cough) clumps of glue. They probably started really hurting anywhere from a couple hours to a few days after they were applied because they pulled at the lashes as they grew and I bet they caused severe pain or at the very least, discomfort. Not to mention that they look like poop. Lashes should be glued on individually. The next time you get your lashes done, look at them in a magnifying mirror. Are they in clumps? Are they going in different directions? If they are, your lash technician does not how to properly apply lashes. And for your final consideration... if she is unlicensed, her basement boutique has not been inspected. This may seem like no big deal, but the Commonwealth of Pennsylvania has some very strict rules for salons and spas. We go through rigorous procedures to make sure that our implements, including those tweezers that are being used on your eyes when getting extensions, are properly cleaned so that no disease or bacteria spreads from client to client. The state will only do inspections if the salon or spa has a license. If your basement technician doesn't hold a cosmetology license, then she doesn't hold a salon license, then she doesn't have training, then she doesn't hold insurance, then she doesn't pay taxes, but... she sure is a good deal. Just so we are the same page. And if you don't believe me, I've attached a few news articles about how dangerous getting eyelashes are from unlicensed, untrained technicians. Just click on the LEARN MORE buttons below. And just for kicks, take a look at the photos of these really bad eyelash extensions! OUCH!